Wolves have Leon Clarke bid accepted. Coventry City striker Leon Clarke. Coventry City have this evening accepted Wolves’ third bid for want-away striker Leon Clarke. Wolves, who have already had two bids for League One’s top goalscorer rejected, have now been granted permission to discuss personal terms with the Wolverhampton born striker. Wolves boss Kenny Jackett is looking to offload Leigh Griffiths to Celtic to free up the move for Clarke, but so far Wolves have themselves rejected two bids from the Scottish Champions, although it is likely an agreement is near, now Wolves have met City’s valuation for Clarke. Clarke started his professional career in the gold and black of his hometown, scoring 15 goals in 83 appearances before becoming a journeyman of the lower echos of the Football League – playing for a total of 14 different clubs. Coventry City manager Steven Pressley revealed his frustration and anger at the striker following last night’s 2-0 defeat at Leyton Orient – a game which Clarke missed through an ankle injury picked up in the 4-0 FA Cup loss at Arsenal on Friday night. 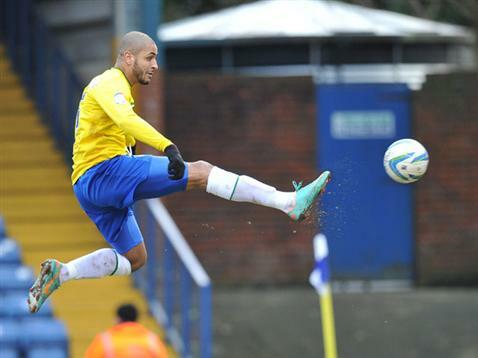 Speaking to the official club website after the game, Pressley said, “Leon Clarke has failed to support this group. The situation has changed over the last 24 hours. “It looks likely that he will leave the club. He gets his wish. He has behaved in a manner to get his move. “I am annoyed as I have got a group of players who are putting everything in for the club and they have been let down. Pressley had to field 16 year old George Thomas – his debut for the club, due to Clarke’s absence last night with strike partner Callum Wilson still at least four weeks away from a return to the squad following a dislocated shoulder. With Clarke now likely to wrap up his move in the next 24 hours, Pressley is desperate to bring in at least two forwards before Friday’s transfer deadline to replace the 18 goal striker, with Aston Villa forward Nathan Delfouneso a reported target in a loan move. « Leon Lobjoit leaves Coventry City.